Hard Rock Cafe Berlin Celebrates 20 Years! Ya know, not many restaurants can celebrate their 20th anniversary. Better than that, though, is that not many restaurants can celebrate their 20th anniversary and people will come out in droves to help them party down. You don't see that at your local TGIFriday's, do you? Ya know where you do see that? Hard Rock Cafe Berlin (or, really, any Hard Rock for that matter because our fans rock the world over), which recently did just that. Though the Cafe moved a few blocks a couple years ago from its original location, the Cafe's presence in this incredibly vibrant city has never gone away, not even for one day. The transition from original to new location was seamless, and the communities support has never waned. Yes, Hard Rock Cafe Bali Rocks! Hard Rock Cafe Bali seems to be a place that a bunch of bands want to play. You think it has anything to do with the fact that they are a.) in Bali, one of the most incredible countries on the planet or b.) that the fans at HRC Bali really know how to give back to the performers? We think it's both because there never seems to be dearth of excellent live music coming out of the Cafe. Two examples right here. Scissor Sisters, one of the brightest new rock/pop/dance/glam bands to come around in the last ten years, and Vertical Horizon, a powerhorse (that's a word, right?) of a band that's not stopped touring since the early '90s, both graced the stage at the Cafe recently, showering the gathered masses with (dare we say? yes, yes we do dare) awesomeness. So, we just wanted to share a some photos (1st two are Scissor Sisters, next two are Vertical Horizon) with y'all and let you know what you're missing out on. Booking your vacation to Bali right now, aren't you? We are. Hard Rock Cafe Budapest Opens In Grand Style! Hard Rock doesn't open a Cafe in every city, for the simple fact that going to a Hard Rock should be a special event, and that's the way our fans like it. They like the travel aspect of going to a new Cafe, of visiting a new city when they do. We like to set up shop in vibrant cities, in areas that get a lot of foot traffic, so that people can also visit the rest of whatever city their in, can discover why we chose that city in which to be. Budapest is one of those vibrant cities. It is, in fact, an incredible city, modern and classic, quiet and loud, reclusive and gregarious, all at the same time, sometimes all on the same block. That's one of the reasons we decided that Hard Rock Cafe Budapest was a great idea. The city called to us. No, really, it did. And what did we do? We answered, of course. Having been open for a little while already (what we in the "business" call a soft opening), HRC Budapest's grand opening really showcased the best of both Budapest and Hard Rock. We just wanted to share a few photos from the event, which, we're told by those who actually remember the evening, was a grand time. 05.30: On this day in 1987, Ireland took over the US charts. U2 was No. 1 with “With or Without You” and Chris de Burgh scored one for every guy that’s met some girl at a bar and woke up the next morning wondering why she was in his bed with “Lady in Red”. Two very different songs, yet both very much of the '80s. Can you guess which one is our more favoritest? 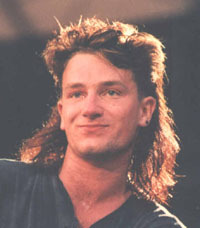 Yeah, we're big on that Bono guy. He's dreamy. On Thursday May 24th, the Hard Rock Cafe Boston hosted a Rockin’ Red Sox event along with Fender, ABKCO & The Red Sox Foundation. Hard Rock acquired a custom, special 100th commorative edition Fender guitar and Wally the green monster was in attendance to take photos with the guests as well as Red Sox players Darnell McDonald, Daniel Bard & Jarrod Saltalamacchia. The Red Sox Scholars came onstage and led the audience with a rendition of “Take Me Out To The Ballgame” to close out the event before the raffle. The Red Sox Foundation supports health and education initiatives for children and families in New England. ALL IS ONE. Hard Rock Cafes in Hollywood, CA have teamed up with Los Angeles’ own Matt Sorum, Rock ‘n’ Roll Hall of Fame inductee and legendary drummer for Guns N’ Roses and Velvet Revolver, for a cause that is very close to his heart – saving arts and music in our schools today. From now through Saturday, June 30, 2012, $5 from every Local Legendary Burger purchased at Hard Rock Cafes in Hollywood, CA will be donated directly to the Adopt the Arts Foundation, an organization co-founded by Sorum, whose mission is to help save the arts in America's public schools. The organization was created as a response to the decision by the Los Angeles Unified School District to eliminate all funding for elementary school arts programs. “Making sure that all children have an opportunity to express themselves creatively through art and music, is a cause that I am incredibly close to,” said Matt Sorum. “With this Local Legendary program, Hard Rock and I hope to raise much-needed funds and awareness for this great charity.” ALL IS ONE. Hard Rock Cafe Las Vegas Rocks The Cause With Holly Madison! The Hard Rock Cafe Las Vegas Strip focused their Rock The Cause program on animal cruelty awareness for the month of April. They partnered The Animal Foundation, a non-profit organization that operates The Lied Animal Shelter in Las Vegas, Nevada's largest animal shelter and animal adoption center. Las Vegas' It Girl, Holly Madison was only too glad to help since one of her own puppies came from the Lied Animal Shelter. Holly was nice enough to help present the hundreds of sheets, towels and blankets collected from the MGM Grand, Monte Carlo and Mandalay Bay, enough to equal 3 truck loads! The first stop for Run it Forward was the Hard Rock Cafe in St Louis. Jacoby Shaddix and wife Kelly greeted guests and signed autographs. Run It Forward is an innovative approach that addresses the education equality crisis facing today’s school children. In addition, Run It Forward (RIF) educates on fitness, nutrition, and the value of health and dental care. RIF is where education and endurance collide. As a nonprofit, RIF stretches the limits of human endurance, tenacity, and community outreach on behalf of America’s schools. TAKE TIME TO BE KIND. Everclear frontman Art Alexakis hit up six (yes six!) Hard Rock Cafes in a week! Art graced the stages of Chicago, Detroit, Cleveland, Pittsburgh, Denver and Seattle with an acoustic set that included Everclear's "Everything To Everyone", "Wonderful", "Santa Monica" and of course, "Father of Mine". While the songs were performed to near perfection, it was the in between banter that Art really showed a side that most fans may not have known was there - a warm and very funny artist that is more than a songwriter with "issues" as he described himself on stage before doing "Father of Mine." This playfulness was revealed through witty asides with the audience and stories about his daughters and four marriages, but it really was revealed twice during the show when Art brought fans up on stage to help with the background vocals on two songs - one being a group of female fans he brought to the stage to accompany him on "Volvo Driving Soccer Mom."